The Best Time of Year to Launch Your Coaching Group - Coach & Grow R.I.C.H. First, it’s a little bit of a trick question, because the best time to start a group is when YOU are ready and excited to launch one… Right!? Second, you want to consider your ideal group participants… Are there certain times of year that are better or worse for them? => If your target market is accountants, you’d be wise to avoid the busy tax season… And instead start your group in the early summer or sometime in the fall. => If you’re coaching parents, don’t start a group program during the summer or at the very beginning of the school year… Instead, wait until the “back-to-school” madness has settled down. => If you’re focused on helping singles find their soulmate it makes sense to time your group around Valentine’s day. One of the reasons this is my personal favorite is because you can leverage the New Year Effect… The time of year when people naturally focus on making a fresh start, setting important goals and going for the things they most want to achieve. March, April and May are also great months to launch your coaching group… You avoid the new year frenzy, have plenty of time to implement an effective marketing campaign and depending on your group duration, you can wrap-up your group before the summer. Late September thru end of October is another excellent time to kick-off a coaching group. Folks are back from summer vacation, students are back to school and you’ve still got a couple of months left to finish the year strong. When are you going to launch your first or next coaching group? #1 – Woo Hoo and great decision! #2 – Map out your group coaching game plan NOW. The fact is, there are a number of factors you need to consider and implement to successfully launch a group coaching program. You can totally do it… and you’ll maximize your success when you roll up your sleeves and lay the groundwork sooner rather than later. To help you out, I’m doing a live webinar specifically on this topic and I’ve reserved a free seat for you! Claim your free seat here. How to take advantage of the “New Year Effect” so that your group practically fills itself. The 3 things you MUST have so that it’s a no-brainer for your ideal clients to say “YES” and sign up for your group program. The #1 MISTAKE most coaches make when launching their coaching group… and what you can do differently to avoid this painful pitfall. The specific steps to create a lucrative and leveraged coaching business where you maximize your impact, income and free time by coaching groups. PLUS… I’ll be answering questions and providing laser coaching live on the call! 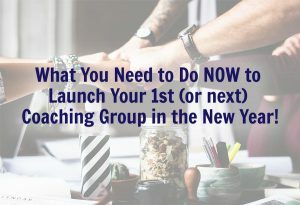 Click here to find out what you need to do NOW to launch your 1st (or next) coaching group in the new year!